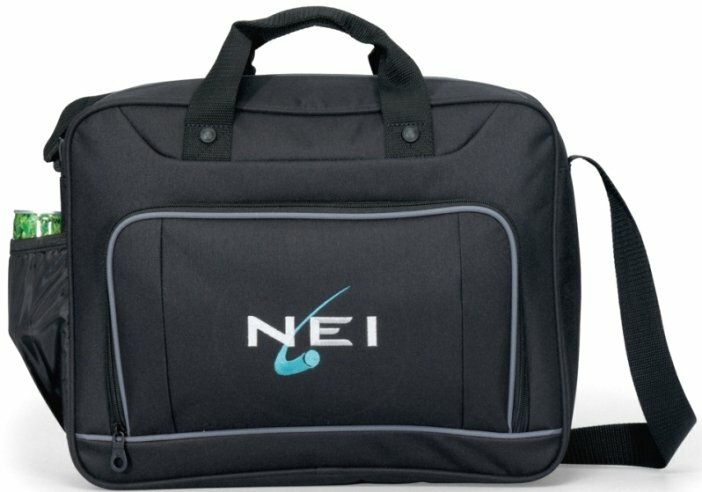 Keep in step with this promotional laptop bag at the lowest cost possible printed with a company logo. Applications include schools, universities, recruitment, employees or as inexpensive corporate gifts. with sleeve for up to 15" laptop, front zippered pocket exposes a multi function organizer. side pocket for holding a water bottle, dual grab handles and adjustable shoulder strap. Overall size of the Capital Steps laptop bag is 15 1/2" w x 12" h x 4 1/2" d.
Rush Laptop Bags Production is available. Price includes a one color imprint on the front in an area 7" w x 5 1/2" h.
add a screen of $55 and running charge of $.99 each. Logos require Illustrator eps with a confirming pdf. and up to 7000 stitches in an area up to 4 1/2" diameter. add $25 tape and a running charge of $.30 each. Logos require Illustrator eps with confirming pdf.